With this Hamilton Beach model four quart ice cream maker, it takes only twenty to forty minutes to create delicious frozen goodies. The operation is automatic and the machine enables you to make homemade ice cream, frozen yogurt, custard, gelato, and sherbet. All you do is add your ingredients to the canister, assemble the machine, add ice and salt to the bucket, and let it churn. This item comes equipped with an easy lock lid. The parts should be hand washed. The unit comes with a manual and twenty recipes as well as a one year limited warranty. 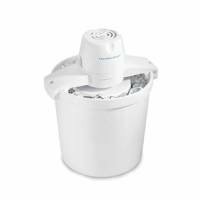 The Hamilton Beach Ice Cream Maker is great for parties and family gatherings or just to prepare your own favorite flavor combinations whenever you want them. Some find the motor a bit on the noisy side (less noticeable outdoors), but it is easy to tolerate when the result is a creamy treat. No need to freeze the canister, so there's no extra wait, planning, or space occupied in your freezer. There is no cranking involved. People are overwhelmingly happy with this item and find going back to storebought ice cream difficult once they've had their own blend. You control the ingredients and you choose the flavorings- what could be better?